(Paighten Harkins | The Salt Lake Tribune) West Jordan police stand near the entrance of an apartment where an officer fatally shot a man on Oct. 11, 2018. 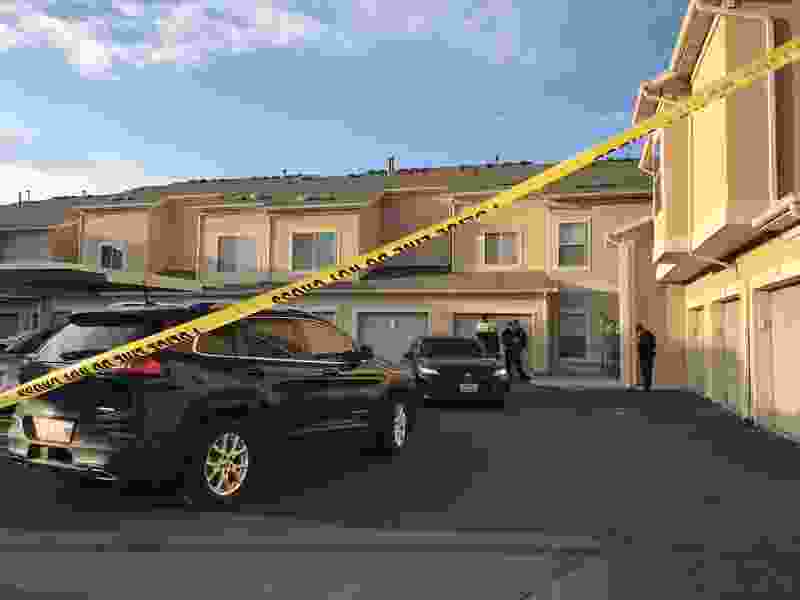 Police were called to the complex, near 7000 South Cherry Leaf Drive, to investigate a domestic dispute between a man and a woman, and believed the man had a weapon. West Jordan • A man involved in a domestic altercation with a woman at an apartment complex here on Thursday was shot and killed by a police officer who was called to investigate. Police haven’t released the names or any other identifying information of the man or the officer who killed him. Officers were called to the Liberty Landing Apartments, just off Center Park Drive near 7000 South, about 4:20 p.m. The caller said a man with a weapon was fighting with a woman with whom he had been in a relationship, Sgt. J.C. Holt said. Three officers went to the apartment, where they found a woman, a man and an infant. While they were in the apartment “there was some kind of altercation,” and an officer shot the man. Holt said he doesn’t know how many shots were fired. The man was pronounced dead at the apartment. The officers and the woman were not injured. Holt said officers knew the man because of previous domestic violence-related calls at that apartment. Unified Police Department is investigating the shooting, as per the valley-wide officer-involved critical incident protocol. The protocol mandates an outside agency investigate an agency’s police shootings. The officer, who has been working with West Jordan police for less than two years, will be on administrative leave until the investigation is complete.